The Hemingway name will carry this beyond what the usual casual interest in reminiscences of hunting in Africa would ordinarily achieve. 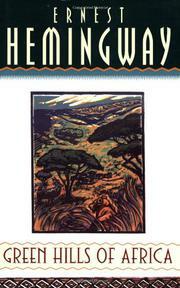 It contains some of the best writing Ernest Hemingway has done -- and is a delightful human document, natural, humorous, graphic in the swift characterizations and the original sidelights on his companions. Game hunting in Africa -- with a double urge, to get, first and last, a Kudu -- and to beat Karl. Sell both as travel and sport -- as well as good Heminway. Appearing in Scribners Magazine.